Welcome to INCH (Inclusive Network of Cooperative Homeschoolers*)! We are an eclectic group from many counties who home educate for a variety of reasons. We are made up of diverse backgrounds, religions, and cultures. We all use different methods of learning. What we do share in common is a thirst for knowledge and a passion for learning! We have classes and field trips together, we talk together, we play together. If you feel our group is a good fit, please join us! *Metric friendly! This information came from our annual planning meeting, open to all adult members of INCH. The online calendar is always the most updated source of information. Thanks! Keep reading to learn about the MANY activities, clubs, field trips, events, classes, etc. we’ll be enjoying this year!! INCH Fridays - INCH families meet weekly on Friday afternoons from May through September for Park Days. From October through April, there are several activities that meet on a regular basis. Details, including times and dates and location, will come directly from the coordinator of each activity. Many of them are popular activities that we have done in past years, and some are new for this year. Anyone in the group is welcome to plan anything at anytime – all we ask is that you never schedule an activity at a time when another INCH activity is already meeting. In addition to our regular activities, we have a few annual INCH activities. Here is a list of just some of the activities that are being planned this year. If there is an activity that you would like to plan, feel free to run with it. Please remember that kids can plan/lead activities as well – in fact, it is encouraged! People plan field trips throughout the year. We already have a number of field trips (and more are being added!) in the works, but like I've said, feel free to plan any outings you would like. While one of the primary reasons we formed INCH is to provide opportunities for group learning and socialization, another wonderful benefit is the opportunity for parents to come together, learn, and support one another. Our parent activities happen throughout the year. We're all looking forward to a great year! Thanks to all who work so hard to make INCH such a great, close-knit group of families! We are in the middle of our planning time. Stay tuned for a list of some of the great things INCH is doing this year! This information came from our annual planning meeting, open to all adult members of INCH. The online calendar is always the most updated source of information. Thanks! Keep reading to learn about the MANY activities, clubs, field trips, events, classes, etc. we’ll be enjoying this year!! Hopefully I haven't forgotten anything . . . INCH Fridays - INCH families meet weekly on Friday afternoons year round for social/activity time. May through September, we meet for Park Days. October through April, we meet on some Fridays for outings, activities, field trips, etc. In addition to INCH Fridays, these are many activities that meet on a regular basis throughout the year. Details, including times and dates and location, will come directly from the coordinator of each activity. Many of them are popular activities that we have done in past years, and some are new for this year. Anyone in the group is welcome to plan anything at anytime – all we ask is that you never schedule an activity at a time when another INCH activity is already meeting. Teen Nights (Monthly, Ages 13+): Coordinator: Stacy F.
Book Club (Monthly, Ages 10-13) - Coordinator: Mark F.
Art Class with Miss Jenny (twice monthly, ages 5+) - Coordinator: Desiree H.
Nerf Club/Game Club (Monthly) - Coordinator: Dave J.
Wishbone Book Club (Monthly, 5+) - Coordinators: Sherri B.
Scholastic Book Orders - Coordinator: Jenn M.
Lego Club - Coordinator: Angie Z. Middle Creek Wildlife Classes (A few times/year) - Coordinator: Mary L.
Knitting Club - Coordinator: Cristin E.
Service Activities at CATRA and food pantries – Coordinator: Mary L.
More groups are being formed . . .
May Day - Coordinator TBA (volunteer appreciated). Here is a list of activities that we have done in the past, but not necessarily annually. If there is an activity that you would like to plan, feel free to run with it. Please remember that kids can plan/lead activities as well – in fact, it is encouraged! There are some activities that INCH members have already agreed to plan (names are listed in parentheses), as well as others that anyone can feel free to plan if they’d like. As always, if you have an idea for an activity that is not on our list, you are also welcome to plan it. People plan field trips throughout the year. We already have a number of field trips in the works, but like I've said, feel free to plan any outings you would like. Bus Trips to DC, NYC, etc. Two years ago, we organized a group trip to Colonial Williamsburg, which also included excursions to Jamestown Settlement, Monticello, and other local sites. It was a big success. This year we may plan a trip to Boston, MA or some other location, should families in the group decide to coordinate one. As with our previous trip, travel arrangements including transportation, lodging, and food, are up to each individual family to plan. Not only will this make things less complicated, this will allow everyone to plan a trip that works well for their own travel styles and budgets, whether it be a hotel, camping, a vacation home, staying with relatives, or whatever. We will have fundraising opportunities to help make the trip more affordable for as many families as possible. Each family that is going on the trip is welcome to plan one fundraiser in which we can all participate. Any family that plans a fundraiser will share in the proceeds of all fundraisers. If your family would prefer not to fund-raise and would rather just pay for the trip outright, that is okay. Just be sure to let us know so we can know what to expect. These fundraisers are not only a good way to help defray the costs of the trip but they are also additional activities where our children can get together and enjoy a good time. Some ideas so far include a car wash, bake sale, laser tag night, roller skate night, raffle, sandwich sales, and restaurant fundraisers. Should families decide to do the trip, we will have a planning meeting to discuss our tentative itinerary, and then we will have a firm RSVP date of October 31st (saying that you are committed) so that we can do more detailed planning. Once we have a list of those attending, we will get together to hammer out the final details. We're really excited about this and it's a real indicator of how much INCH has grown as a group! An email will be going out soon with more details about this trip. INCH Fridays - INCH families meet weekly on Friday afternoons year round for social/activity time. May through September, we meet for Park Days. October through April, we meet an indoor location (such as the YMCA). We are in the process of figuring out our winter plans for this upcoming year. 20 Things Club (Monthly, Ages 10+): Coordinator: Stacy F.
Book Club (Monthly, Ages 9-12) - Coordinator: Mark F.
Yu-Gi-Oh/Pokemon Club (Monthly) - Coordinator: Max F.
Younger Kids’ Playgroup - Coordinator: Sherri B. Younger Kids’ Card Club (Monthly, Ages 6-10) - Coordinator: Brennan J. Theater Group - Coordinator: Jake W.
Book Club (Ages 6-9) - Coordinators: Jenn M. & Sherri B. Nature Club (all ages) - Coordinator: Sherri B. Cooking Lessons (Ages 10+) - Coordinator Dave J. Service Activities – Coordinator: Kadie B.
Yearbook Club – Coordinator: Chris B.
End-of -Summer Potluck (September 27th) - Coordinator: Kadie B. Holiday Party - Coordinators: Kadie B. and Becci S.
This past year we organized a group trip to Colonial Williamsburg, which also included excursions to Jamestown Settlement, Monticello, and other local sites. It was a big success. This year we are planning a trip to Boston, MA. As with our previous trip, travel arrangements including transportation, lodging, and food, are up to each individual family to plan. Not only will this make things less complicated, this will allow everyone to plan a trip that works well for their own travel styles and budgets, whether it be a hotel, camping, a vacation home, staying with relatives, or whatever. We will have a planning meeting to discuss our tentative itinerary, and then we will have a firm RSVP date of October 31st (saying that you are committed) so that we can do more detailed planning. Once we have a list of those attending, we will get together to hammer out the final details. We're really excited about this and it's a real indicator of how much INCH has grown as a group! A small yearly fee. For the 2018-2019 year, the fee is $25 per family due no later than March 10/September 10 respecively. This is to cover administrative costs.There will be no refunds or exceptions. Adult participation in planning or helping execute at least one event during the 12-month INCH cycle. Membership in INCH entitles you to access to the INCH email list, member directory, and calendar of events. Multiple email addresses for each family may be added to the list if desired for no additional cost. A planning meeting is held annually, and all adult members of INCH families are welcome to attend in order to help plan the year's classes, events and trips. INCH members are encouraged to add and conduct events throughout the year as well; please contact the calendar coordinator about adding them to the calendar. INCH is a private, member-only group. Only people in INCH can attend our classes and activities on a regular basis. Classes and activities are not open to those outside of INCH (people on the waiting list,however, can come once or twice to check out the group). Occasionally, a one-off activity or field trip may require a minimum number of participants in order to be scheduled or receive a group discount. In these cases, where minimum numbers are dictated by an outside venue, and there are not enough participants from within the INCH group itself, outsiders may be invited after receiving Admin approval.In these cases, those approved outside invites must be announced clearly to INCH via email so that members can be informed and make decisions accordingly. Please note that we do NOT use social media (Facebook, Twitter, etc.) as an official means of communication for the group. Although general information about the group will be available publicly, individual and specific information will be available ONLY TO MEMBERS on other parts of the site. The administrator will never sell your personal information. Any information that you choose to share (for a directory of group members, for example) is opt-in only, and your contact information won't be published without your permission. Please use your best judgment about when and how you share your contact details. Access to the email list is part of INCH membership. Names will be added to the list during two sign-up periods in September and March. To be included on the email list, payment must be received by September 10 and March 10 respectively. Those who wish to join the email list outside of the sign-up period will be placed on a wait list and added during the next sign-up period. Change of address requests will be addressed during sign-up periods. Please do not use the group list for emails containing political, religious, or non-educational commercial material. Content should relate to homeschooling issues, events or opportunities. Forwarding emails to individuals who are not members of the group is considered a violation. Violators will be removed from the list. Please take notice of the person originating correspondence and reply to that individual with questions, RSVPs, etc. Responding to unrelated individuals creates confusion for the group and increased work for the list administrator. Please handle conflict privately, directly and off-list. Please send information about all clubs and all activities to the group at large to keep everyone informed (no smaller, off-list emails, as it causes confusion). Deliberate misuse of the list will result in temporary or permanent removal, at the list administrator's discretion. INCH members are expected to be civil to one another. Disagreements should be worked out privately between those involved; all members of the group deserve to be comfortable during group meetings. INCH is an inclusive group and welcomes various viewpoints. Please be aware in your dealings with others that they may differ from you on educational, religious, political and social issues, and that we are all required to treat each other with civility despite our differences. Inappropriate behavior (such as gossip, proselytizing, abusing private information disclosed on the group list, etc.) is discouraged. Please be respectful of others around you. If you can't be civil, you will be asked to leave the group and removed from the email list. THE BOTTOM LINE: Remitting payment for INCH membership indicates that you agree to adhere to this Participation Agreement. Violation of any terms specified herein shall be grounds for dismissal from the group. Please keep a copy for your records. I, together with a few other families, started INCH in 2006, and in a relatively short time the group has grown tremendously. If you have attended any activities during the year, you have seen how large and diverse a group we have. We have had some activities with more than 100 people in attendance. This is wonderful. With such growth, however, comes a lot of challenges on the administrative side. Over the past few years, there has been much discussion about various ideas to help make our group even better. We have discussed issues from safety to privacy to time and efficiency (a great deal of time goes into the behind-the-scenes management of the email list, calendar, and website, most especially the email list that currently has over 90 families on it) to civility as well as various members’ levels of commitment to the group. The concern over these issues has been growing steadily over the past few years. Therefore, we have some changes we are making with the hope that we can streamline our efforts and also address all of these concerns. For the first time we are asking members to read and agree to a set of group rules. The complete agreement will go out in a future email, but here are a few details of which you should be aware. For the first time we are asking each family to pay an annual registration fee. This will be a nominal fee required to stay on the INCH membership list. This fee will give each family access to the private email list and group emails, private calendar of events, and our new opt-in directory. 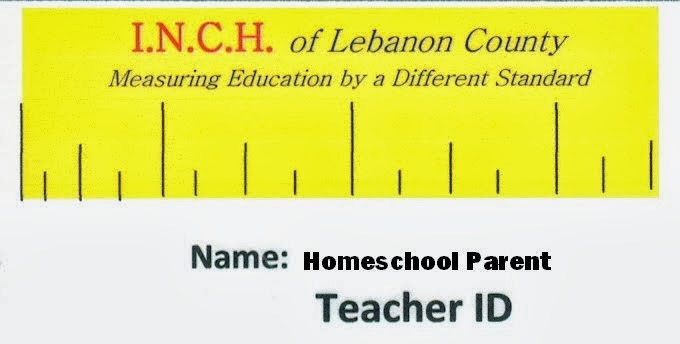 Each INCH participant will also receive a membership card/student (or teacher) ID, if you desire. Group list maintenance will happen twice per year on September 10 and March 10. These will be the only times that we will be adding people to the list. Anyone who wishes to be added between these times will be placed on a waiting list until the following registration date. (This year, we are giving everyone more time to review the updated INCH information and comply with the changes – you have until September 30th). As always, we ask each family to make at least one contribution to INCH each year. This can be a class, fieldtrip, other activity, or some sort of supportive role (park days reminders, parents' night out organization, etc.). I will continue to maintain the list. Mark F. will continue to keep our calendar and website updated. Dave J. will be responsible for welcoming new members, including fielding emails with questions about how INCH works, what types of activities we conduct, general homeschooling inquiries, and anything else of that nature. Sherri B. will field all questions related to the INCH membership agreement and registration fees. She will also be in charge of maintaining our INCH directory. This will be strictly opt-in, with each individual family deciding which information will appear on the directory. Families are not required to be on the directory. Becci S. will make and distribute the INCH membership/ID cards. These cards will be available after the registration deadline has passed. We are in the process of updating our website to reflect all of these changes. Registration Dates: September 10 and March 10. If you are finding us between registration dates, we will add you to our waiting list. You will be added to our membership list and gain access to our private calendar on the next, upcoming registration date. Thank you. Please take time to review the INCH Guidelines and Participation Agreement. If you are interested in becoming a member of INCH/getting on our waiting list, please let us know by emailing us at inchoflebanoncounty AT gmail DOT com. This is not the same as our waiting list--for that, please send an email to the address above in red. Thanks!